The Arizona Solar Center is often asked the question “How do I find out if solar energy is the right choice for me now?” It seems like a simple question, but the answer really depends on the situation. Cathodic protection to prevent corrosion in pipelines, wells, bridges, etc. Power for refrigerators, lights and communications in remote medical centers. If the previously mentioned uses of lighting, communication, refrigeration, water pumping, etc. are combined into a single power system, renewable energy can be used to provide power for the basic needs of entire villages, encampments, and recreational areas which may be too far from power lines to ever have grid-supplied electricity. 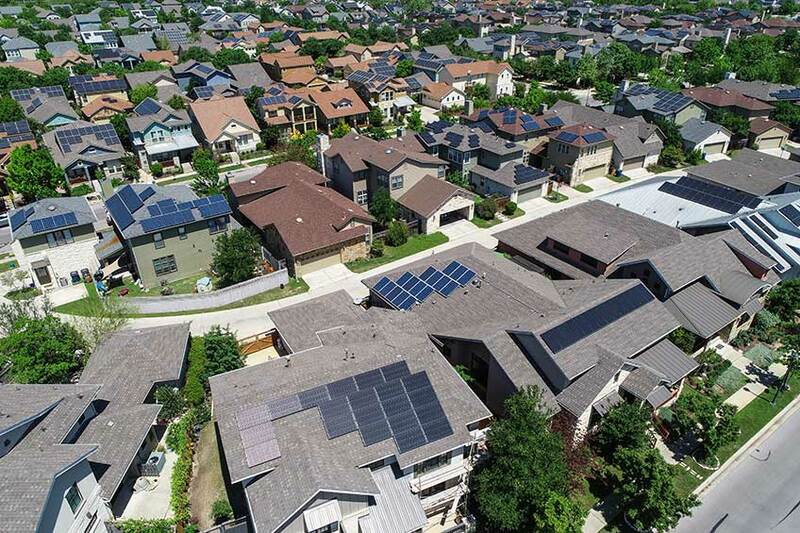 Over the last decade it has become routine to have home solar electric systems that are connected directly to the local utility and operate without batteries. These are called grid-tied systems, and are the focus of most residential and commercial activity. In Arizona there are utility rebates (actually incentives to install, with the resulting environmental credits being assigned to the utilities) that offset a substantial portion of the costs of installing grid-tied PV systems. In some cases this can include domestic hot water systems. Refer to other parts of the Arizona Solar Center website for more information. There is also information here about tax credits and rebates. To begin answering the question “How do I find out if solar energy is the right choice for me now?” please review the following Frequently Asked Questions. After understanding this basic information, please see our "Path to PV," which follows a typical but fictitious family on their journey of learning and finally making the decision to go solar. Frequently Asked Questions- Is solar energy the right choice for me now? Energy conservation- Invest in more efficient air conditioners, insulated windows, etc. Do I own my own home, or can the improvement be moved if necessary? Are there any incentives and rebates available in Arizona? Why should I consider buying a PV system? A PV system reduces or eliminates the amount of electricity you purchase from your utility or electric service provider. A PV system can be an excellent investment, save you money on your electricity bill and act as a hedge against future price increases. The electricity generated by your PV system is clean, renewable and reliable. You help your community by reducing the load on the utility grid. You can provide additional electricity for the grid when you generate more than you use during the day, when electricity demand is highest. How do I relate system size to energy produced? You can match the size of your system to your electricity needs and budget. The average household in Arizona uses over 10,000 kilowatt-hours (kWh) per year. If your usage is typical of the average household, a system in the 5 to 8 kilowatt (kW) range would be adequate to meet most of your electricity needs. It is usually not advisable to displace your entire utility bill, since efficiency improvements and conservation could cause you to produce more energy than you use. Currently, utilities do not pay competitive rates for generation above annual usage. You will need to enter into an Interconnection Agreement with your utility. This agreement addresses the terms and conditions under which your system will be safely connected to the grid. The agreement also specifies the metering arrangements for any surplus electricity your system generates on the electric grid. Excess electricity might be generated during the day when your system produces more electricity than you need. Your meter would simply run backwards to record the amount of electricity 'sold' to your utility. If you select a rate plan with Peak and Off-Peak periods, the utility will most likely account for the net metering by rate period. This is very utility specific, see the article Arizona Electric Utility Information. Older PV systems may have qualified for net metering where in any excess production is banked with the utility for later use. How can I estimate the best size system for my home or business? To estimate the best system size for your home or business, please review our article on Considerations in sizing a PV system in Arizona. There are ‘Solar calculators’ on the web. APS has a link to a calculator (NOT WORKING)(http://www.aps.com/main/services/ nexus/SCdefault.html?t=R) that will give ballpark cost and performance estimates. First of all, do not install a system that produces more energy on an annual basis than you expect to use because the present utility tariffs generally have a low credit for the excess. If in doubt, start small and ask the installer to plan for expansion in the future (i.e. install a larger inverter and conduits at little extra cost). However, check on your utility policy on this as any system size changes may cause loss of any favorable grandfathering of buy-back rates. What does a typical PV grid-tied system look like? Although many factors affect the cost, an average PV system costs from $2.50 to $4.50 a watt, including installation. This is about $10,000 to $18,000 for a 4 kW system. At present (2019) there are no incentive rebates. There are tax credits that may apply to your situation, see our article on Renewable Energy Incentives. Are there any financing programs available? The best way to finance a PV system for your home is through a mortgage loan, which includes a primary or secondary mortgage or home equity loan secured by your property. If mortgage financing is not available, look for other sources such as conventional bank loans. In August of 2008, APS announced a financing program for its customers who desired to finance systems installed under their incentive plans. A variety of “leasing” programs are becoming more common in the industry. The buyer is cautioned to do an in-depth financial analysis or consult a qualified party to determine the best approach for his or her system. How do I find a PV retailer? The Arizona Solar Energy Industries Association provides a list of PV retailers and installers. Retailers either can provide installation or can refer you to installation contractors in your area. Try to find a company located in the area where your system will be installed. Price is only one factor when selecting a PV company and/or contractor. Does the company use licensed Arizona contractors? If you get more than one bid, make sure that the bids are for the same identical size system. How do I know if I am being offered quality equipment? Arizona law requires that PV modules be listed to UL1703, check the data sheet. Inverters and charge controllers should be listed to UL1741. PV installations are subject to the National Electrical Code and building permits. Check with your local building permit office to determine which version applies, there is no Arizona statewide policy in this area. How does it work with my electric utility? How does the billing work? What if I sell the home? Generally, the utility installs a bi-directional kilowatt-hour (KWh) revenue meter that measures power flow in both directions. The resulting bill will usually show how much energy you have used and how much you fed back to the utility. Any balance in your account should be listed for future use. The utility usually requires the PV system installer to install a socket for a second KWh meter that measures the output of the inverter as well as a lockable disconnect switch in case the utility needs to work on the utility line nearby. Generally the systems operate automatically. They do have ON/OFF switches and a utility lockable disconnect switch. Most inverters have a digital display or indicators that show operation. The homeowner should be provided with an operations manual for the system by the installer. Generally, the natural rain keeps the solar panels clean enough (without calcium deposits from tap water). If desired, they can be cleaned. A hose is usually suitable. Use caution, as this can be dangerous due to the height and a remote possibility of electrical shock. What will it look like? Will it affect anything? Modern inverters must meet radio frequency non-interference specifications and as such should not interfere with radio and TV. Can I monitor the system with my computer? Most, but not all inverters are capable of sending data to a computer for monitoring. An accessory card may be needed. Consult the user manual or your installer for specifics. How long will it last? What is the warranty? Modern systems are reliable and should last 10-25 years before any repair or replacement is needed. Arizona law requires a full two-year warranty by the installer. Most inverters have available extended warranties up to 10 years. Most PV modules have a 20 or 25-year warranty. Do I have a suitable roof or ground area? What kind of roof can be used? PV mounting systems are compatible with all roof types including tile, shingle, metal and flat. What about HOA Approval (when necessary)? If you live in an area that is governed by a homeowners association, all improvements on your property must be submitted to the board or Architectural Review Committee for approval. Arizona law protects your right to install solar energy systems; in fact, the Arizona statutes are among the strongest in the nation. Your HOA cannot prevent you from installing your solar energy system, but they can have installation guidelines as long as those guidelines do not increase the cost of the system or decrease the performance or life of the system. Just because the law is on your side, don't make the mistake of installing a solar energy system without approval from your HOA. Your contractor will provide you with the information that you will need to complete the HOA's application and can help you with the application process. If you encounter problems with your HOA, your contractor will also be able to give you advice on how to proceed to ensure that your HOA follows Arizona law and approves your application. Remember that a licensed contractor must do the installation of your solar energy system. Be sure to check out the record of the contractor who will be installing your system with the Arizona Registrar of Contractors (www.azroc.gov/). Most utilities require a final inspection by the local jurisdiction before they will issue a check under their rebate programs. How to decide on a company? Look at all the factors involved. Does the company have the experience and knowledge to make you feel comfortable? Keep in mind that the lowest bid may “cut corners” and possibly come back with unexpected “adders” and shoddy workmanship. See “The Path to PV,” below which follows a fictitious family through the process. One day, Sunny and Sam Brightly were driving about town when they saw a home with a large number of solar modules on the roof. It looked pretty expensive. Later while watching tv, they saw an advertisement on a new financing plan being offered to help make the installation of solar systems more affordable. They remarked about it, but took no action at the time. The following week their oldest child came home from school and told them how they had just learned about using sunshine to make electricity. He asked his parents, "Why don't we do something to use solar energy?" The parents said "Let's see what we can find out on the Internet." They searched "Solar Energy" and "Arizona." A top hit was the Arizona Solar Center, so they looked at it. There was a lot of information and various descriptions of programs, including a list of other organizations. Since they had seen news about utility incentives and there were links from their utility’s webpage to solar programs, they followed a link to their utility's solar section and reviewed the basic steps. Using their utility, the Arizona Solar Center, and other sources as references they decided to ask three different companies to make presentations and estimate the cost and performance of potential PV systems that would best fit their home. All three suppliers visited the home, took measurements of the roof area, inspected the electrical service and decided on the best place for the inverters. Each approach was different; one supplier presented three basic standard kits with about a two to one range in costs and no specific options. Good looking literature, but only annual performance data. Another supplier arrived with a copy of an aerial photo of the house (obtained from the www.maricopa.gov/assessor web site) with an initial layout of an array of specific PV modules that seemed to fit well. There was a detailed quote for the illustrated layout and an offer that the size could be easily varied and a new quote printed out. All three suppliers were either Arizona licensed contractors or used a related contracting company for the installation. All asked about any Home Owner Association (HOA) restrictions, which the Brightly’s did have. All explained the legal situation in Arizona and took photos for future reference. It was determined that the home had a south-facing main roof area with asphalt shingles at a four to twelve tilt (about 24 degrees), and with no shadows on the roof from other homes or trees. The south side was the back of the house and the electrical service was on the east side of the house with 200-amp service and available space in the circuit breaker panel for a 2-pole breaker. Because of their HOA, the Brightly family also had the requirement of applying for permission from the Architectural Review Committee to install the system. They were now faced with evaluating three differing bids, some with size options. All suppliers offered different brands of PV modules, different inverters, and different mounting kits. This was all very confusing. The family asked for some customer references and even looked at one system that was nearby. They checked the contractor names on the Arizona Registrar of Contractors website (www.azroc.gov/) and all were in good standing with residential electric (R11 or CR11) electric licenses. Calculated the cost per installed watt for each quotation. This resulted in figures running from $2.30to $4.00 per peak watt (the maximum rated output) prior to any rebates. Small systems had the higher cost per watt. For comparison the Brightly's calculated the estimated annual kilowatt-hours per PV array installed. This resulted in figures running from 1,680-1,825 kWh. The supplier with the higher figure could not give a good reference for the value, while the others stated that their calculated estimate closely matched the measured performance over a few years by a local utility in Phoenix. They then calculated the cost per estimated annual kilowatt-hour for each quotation. This resulted in figures running from $1.60 to $2.25 per annual kilowatt-hour. They eliminated the supplier who could not justify the high estimated annual output calculation. The decision between the other two suppliers was more subjective and they decided on the supplier who best answered their questions. They asked the successful supplier back to settle on a specific system size and layout on their home. They asked the supplier if he could help with the HOA application and the supplier agreed and marked up a photo of the home to show the proposed changes. With the signing of a contract and an initial payment, the supplier prepared the basic utility reservation for an incentive payment. Both parties signed the reservation and it was sent in to the utility. The utility generally acts on the reservation and sends the homeowner an Interconnection Application with their requirements identified. The Brightly family contacted their HOA and picked up an HOA application. After asking the supplier for a few details, the application was filled out and submitted along with the requested fee. The application was approved and the Brightly’s were on their way to a clean and renewable source of energy. Prepare a set of drawings detailing the system installation for submittal to the local city for a building permit. The drawings and the application, along with the fee were submitted. The city building inspector required specifications of the PV modules, inverter, safety disconnect and mounting details. This was simple compared to some jurisdictions and earlier practices when photovoltaic systems were new technology. Depending on system size and the experience of the building inspector with PV systems, the permit process can range from simple to complex. As an example, the Solar ABCs-developed standardized permit application intended to be adopted by cities and counties is linked here for reference < http://www.solarabcs.org/about/publications/reports/expedited-permit/forms/index.html>. Most counties and larger Arizona cities have blank permit applications available online, but the forms do not detail all of the submittal requirements. Experienced PV installers have expertise in this area. The permits require identification of the licensed installer and are usually applied for by the system supplier. The building permit generally requires about a 2% fee; it is recommended to call first and get an estimate. Fees are based on the contract price. The permit is generally required to be posted on the building where inspectors can easily find it. The supplier submits the required drawings and information on the utility’s Interconnection Application form for approval of the PV system. Documents are generally signed by both the homeowner and the supplier. Requirements vary by utility, so refer to the website of the utility serving the home. After both the permit and the Interconnection Application are approved, the system can be installed. Installation generally requires 2-3 days depending on crew and system size. After the system is installed, both the HOA and Building Inspector are notified of completion and the system is inspected. The Building Inspector will inspect the installation (but cannot operate the system due to the utility policy detailed in the Interconnect Agreement) and if all is good, will issue a ‘Green Tag’ and close the permit. The installer must correct any problems that arise. The utility is then notified of the passed building permit inspection (they may want a faxed copy of the inspection tag) and will schedule the utility inspection. If all is in order (the utility is particularly interested in the grounding, cable sizes, required labels of parts, usually detailed in their Interconnect Agreement), the utility will turn on the inverter, observe proper operation, make a disconnection test, and then leave the system operating. Again, if there are any problems the installer is responsible for correcting them. After the inspection, the utility generally requires an Installation Certification Form (name varies) along with copies of invoices and a statement of payments showing that the homeowners have paid for their portion of the system. Some utilities offer assignment of incentives to the installer. The utility generally mails the incentive payment check within a few weeks. This might seem like the end of the path, but it is not. With the system now operating, the supplier should schedule a training visit with the homeowner and train the homeowner on system operation. The homeowner is due a copy of all user manuals (a system manual is often prepared that contains copies of all documentation). Arizona law (see http://www.azsolarcenter.com/economics/guidelines1.html) requires that the homeowner be furnished a written statement of certification and a statement of performance. This must include what general performance the purchaser can expect from the system under typical conditions in addition to a statement of warranty. There is really no end of the path, but just like the Brightly’s, yours can begin here. Your system should operate for over 25 years with minimal attention and continue to provide benefits that the whole family can share.